Ask fellow campers about "Lolo National Forest, Seeley Lake Campground" and nearby attractions. This is a older National Forest Service Park. There are 29 sites, 3 across from the beach. There is a boat ramp and two beaches. Although there are no "hook-ups", there is water available at various spots throughout the campground. There are 4 vault toilets and two flush toilets, one in the center of the campground and the second in the beach/day use area. The campsites are large, mostly wooded, and private. There are a number of sites that have full sun, some with partial shade and some full shade. Each site had an asphalt pad, picnic table and fire ring. The grounds have been neglected for several years which is why I gave an "8" rating but there is a new Campground Director who is working on improving all of the campgrounds/recreation sites in the district. I would expect lots of maintenance to be done this fall and next spring. The sites are clean as are the vaults and restrooms. 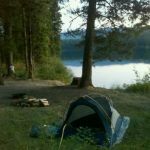 We camped at Lolo National Forest, Seeley Lake Campground in a Motorhome. This campground is 3.4 miles from the "town" on Seeley Lake on Boy Scout Road. Approximately 1/2 mile from the Campground is "Gus" the largest Larch tree in the world. 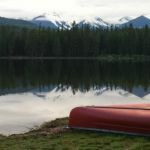 There are numerous hiking and biking trails in the area was well as the Clearwater Lake Trail for canoeing or kayaking which flows into the north end of Seeley Lake. The campground is located on the south end of the lake. Are you affiliated with Lolo National Forest, Seeley Lake Campground ?